after WICI lodges a complaint. 2014 * The NEW BEGINNINGS PAGAN WOMEN RECOVERY CIRCLE. 2013 * The WEAVING TRADITIONS JOURNAL is published June, 2013. 2012 * Our Facebook page launches. 2009 * The WICI-Illiana Chapter creates CELEBRATING WICCAN TRADITIONS, Commemorative DVD, honoring the Pagan Way tradition, as gifts for our Spring Luncheon guests. 2009 * The LINDA BATWINSKI MEMORIAL PROJECT donates $180.00 to the Toys for Tots in her memory. 2008 * WICI hosts the MIDSUMMER WICCAN EXPO : The Face of Wiccan Clergy * Coven * Community. 2008 * Our Annual Spring Luncheon hosts the Illiana Wiccan communities of South Chicago and Gary, Indiana. 2007 - 2009 * Our PROJECT WE CARE collected and distributed over 500 lbs. of donated boxed goods to our Pagan military and prison outreach support activities. 2007 * Our Annual Spring Luncheon hosts Guest Speaker Stanley Modrzyk, noted author and Wiccan High Priest. 2007 * WICI works with the Indiana D.O.C. Religious Services to encourage the Executive Directive #07-71, approving the pentagram/pentacle as a "medallion to be worn or carried", by Wiccan, Witch, and Pagan inmates (approved November 29, 2007). 2006 - 2009 * The WICI begins co-sponsoring the Chicago Pagan Pride 2006-2009. 2006 * Our Annual Spring Luncheon hosts Guest Speaker Ted Chapman, HP of Aglaian Triad of Wicca and Deena Butta, HPS of the Fellowship of Isis Lyceum/Iseum. 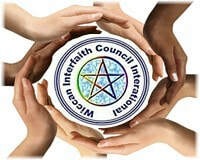 2006 * The Wiccan Interfaith Council International (WICI) is created by Paulette Reynolds and Lisa Ledger in January 2006.